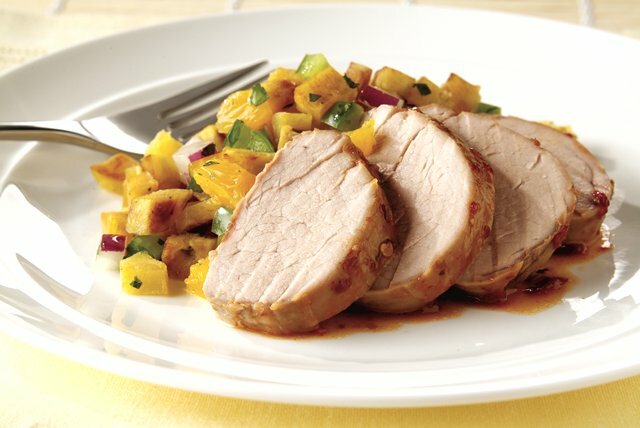 Make our Chipotle Pork Tenderloin with Plantain & Orange Salsa for a dish that's a little spicy, a little sweet and a whole lot of delicious! Requiring just 20 minutes of prep, our Chipotle Pork Tenderloin with Plantain & Orange Salsa is a great dish for busy week nights. Mix dressing, pepper puree and brown sugar. Remove 1/4 cup of the dressing mixture; cover and refrigerate for later use. Pour remaining dressing mixture over meat in shallow dish; cover. Refrigerate several hours or overnight to marinate. Preheat oven to 425°F. Remove meat from marinade; discard marinade. Place meat in shallow baking dish. Bake 25 min. or until instant read thermometer registers 160°F when tested in center of meat, brushing with the reserved 1/4 cup dressing mixture after 15 min. Cut into 1/2-inch thick slices before serving. Cook plantains in oil in large skillet on medium heat 3 to 4 min. or until golden brown, stirring occasionally. Mix oranges, red peppers, onion and cilantro in large bowl. Add plantains; toss lightly. Serve with the meat. Marinate meat as directed. Drain meat; discard marinade. Preheat greased grill to high heat. Grill meat 18 to 20 min. or until cooked through, turning over after 8 min. and brushing occasionally with the 1/4 cup reserved dressing mixture.